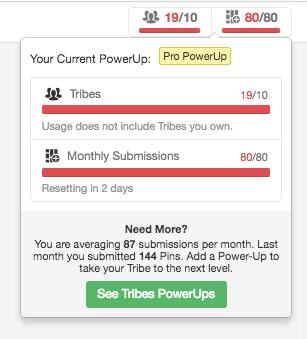 You can see your Submission Limit for how many pins you've submitted to Tribes as well as when the limit resets by hovering over the "Tribes counter" at the top right hand corner of your Tribes dashboard. For instance, if you see "Resetting in 2 days" that means that two days from now your submission count will reset back to 0 and you can submit again. This limit correlates with the date of your billing cycle (for instance on the 7th of each month, if you upgraded on the 7th) and not the first of the month. Need more Tribes and more submissions every month? Learn more about Tribes PowerUps in our Knowledge Base article: How do I join more Tribes with Tribes PowerUps?